I hope you all had a great holiday season and have great plan for 2017. I will admit I did hibernate or at least try to for a few days of our rather cold spell (minus 40!!) and had a few days battling one of those nasty bugs, but all in all it has been a great start to 2017. I have an exciting new announcement, but it’s not quite ready to unveil yet! I have several clinics planned this year in BC and Ontario and even one in Newfoundland! So, if you are wanting more info on these or would like to plan one in your area please contact me. I will also be having the five-day intensive here again in July featuring my clicker superstar school masters for those who would like to see where clicker training can take you or just spend five days enjoying the positive world of clicker training. I’m going to cheat just a tad on this month’s blog. 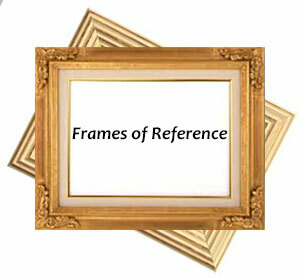 My mentor Alexandra Kurland posted a VERY interesting and VERY, VERY long blog on metaphors and frames of references in our lives and how they can be applied to horse training. She was having a web meeting for those of her students and coaches who wanted to discuss this further. Later that day while I was cleaning the barn, one of my times to think, and I was thinking about frames of reference and suddenly I knew why I didn’t interrupt the ‘meeting’. My frame of reference regarding how meeting were ‘run’ was one of there are people in charge of the meeting and if you want to add to the meeting you need to be recognized by them before you could ask your question. Seeing as the organizers were appearing to be okay with the direction of the meeting, I could not bring myself to interrupt and change the topic. In my frame of reference that was not how meetings were run. And I was not about to be ‘put in my place’ for interrupting. I had no frame of reference for this kind of meeting so didn’t know what I really could or couldn’t do. This is very similar to how people at first react to training without pressure or punishment. Because they have no frame of reference they don’t know what to do and feel uncomfortable. Alex and the author of the book she draws her parallels from do a way better explanation of the frames and metaphors than I have here, but it was a lightbulb moment for me! I encourage you to read this blog. It answers a lot of questions you may have regarding why some people struggle so hard to accept clicker training and hand feeding horses and may answer a lot of questions in other areas of your life and relationships. You will need a large cup of tea, but I think it is worth it! Enjoy and until next time keep it positive.